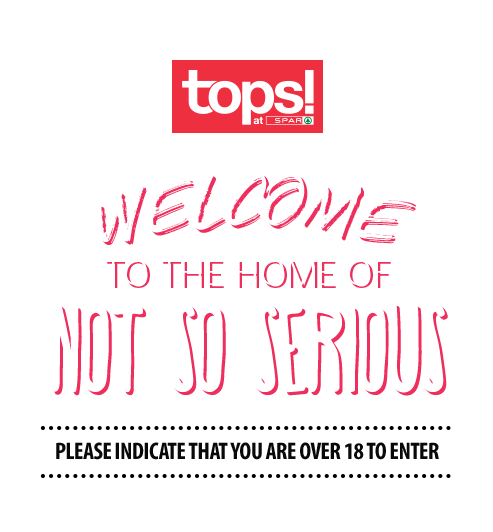 Welcome and thank you for using the website of TOPS at SPAR. This website site is owned and operated by The SPAR Group Limited (“SPAR”) of 22 Chancery Lane, Pinetown, 3610, Kwa-Zulu Natal, Republic of South Africa. This website is hosted and managed in the Republic of South Africa for the exclusive purpose of providing users with convenient access to promotional and other information relating to TOPS at SPAR and products stocked or sold by TOPS at SPAR (the ''Products''). We take reasonable precautions to provide accurate and current information about TOPS at SPAR on this website. However, the content of this website is intended for general information purposes only and is not intended to serve as any other form of advice. You should therefore not assume that the information provided is always complete, accurate or current. We value the comments, ideas, suggestions and feedback (''comments”) disclosed, submitted or offered in respect of TOPS at SPAR, the Products or this website. 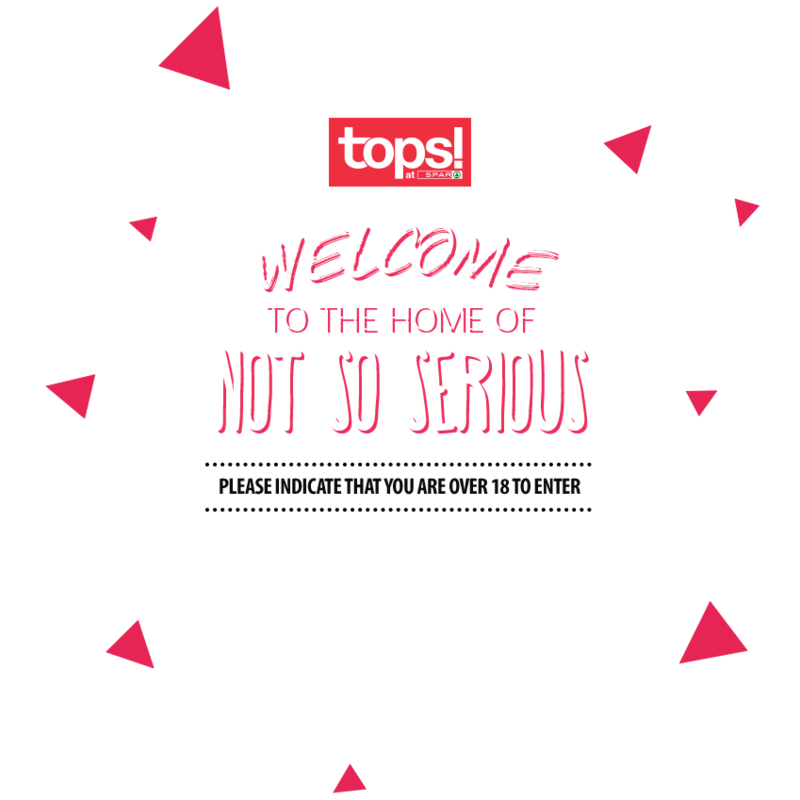 TOPS at SPAR shall, however, not be obliged to respond to, maintain or compensate you in any way whatsoever for any comments or its use thereof. Once disclosed, submitted or offered, your comments and any intellectual property rights attaching thereto shall become the exclusive property of SPAR. You undertake not to disclose, submit or offer any comments that will be, or will contain, any defamatory, unlawful, abusive or obscene material or which violate any right of any third party (including, without limitation, copyright, trademark, privacy or any other personal or proprietary rights). All products displayed on this website are for information purposes only and purchase thereof is subject to availability. All prices displayed on the website are quoted in South African Rands (ZAR) and are valid only at Points of Sale within the Republic of South Africa. TOPS at SPAR reserves the right, without prior notice, to discontinue or change specifications or prices on Products and services offered. External hyperlinks may be provided on the website. You shall not interpret such hyperlinking as constituting any relationship between TOPS at SPAR and any linked third party or any endorsement by TOPS at SPAR of such third party. Use of, or reliance on, any information found using an external link is done at your own risk. Advertising and other promotional material may appear on the website from time to time. You shall not interpret such advertising or promotional material as constituting any relationship between TOPS at SPAR and any third party or any endorsement by TOPS at SPAR of such third party. Use of, or reliance on, such advertising or promotional material is done at your own risk. Use of this website is done entirely at your own risk. The site and its contents are provided on an 'as is' and 'as available' basis and TOPS at SPAR makes no representations or warranties of any kind, whether express or implied, including without limitation with respect to the website, its contents and the completeness and accuracy thereof. SPAR does not warrant that the functions provided by the website will be uninterrupted or error free, or that the website or the server that makes it available are free from viruses or other harmful elements. Neither TOPS at SPAR, nor its, employees, officers, designees, agents, representatives, affiliates and suppliers shall be liable for any loss, damage (whether direct, indirect or consequential) or expense of any nature whatsoever which may be suffered as a result of, or which may be attributable, directly or indirectly, to the use of or reliance upon the website (including any information contained thereon). You hereby indemnify TOPS AT SPAR and keep it indemnified against any loss or damage suffered or liability incurred, including without limitation in respect of any claim or demand by any third party by reason of any act or omission on your part or that of any family member, agent or representative acting on your behalf in connection with the website. These terms and conditions constitute the whole agreement between the user and TOPS at SPAR relating to the use of this website. Any indulgence of extension of time granted by TOPS at SPAR to you shall not be construed as a waiver or variation of any of its rights or remedies. At the option of TOPS at SPAR, any dispute arising out of these terms and conditions may be brought in any Magistrate's Court of competent jurisdiction notwithstanding that the amount in issue may exceed the jurisdiction of such court.